Today's tool: Axure RP 5.6. According to Axure, Axure RP is "the leading tool for rapidly creating wire frames, prototypes and specifications for applications and web sites." You can use it to create high fidelity designs for web sites and applications. Axure ships with a large set of features to help you in this process. One of the major features of Axure is its programmability model. It's pretty easy and straightforward to program behavior behind buttons, text boxes, panels and other UI widgets as Axure calls them. By programming behavior, your design sketches or prototypes get a much more "final feel" helping you and your customers determine what's right or wrong, what works and what doesn't and enables you to test out many flows through the application without programming every single behavior for real in your development environment. Although "programming" may sound difficult (or scary if you're not a developer), you'll find that in Axure you can accomplish quite a lot even if you don't have a programming background. Many of the widgets that ship with Axure have interactions attached to them. 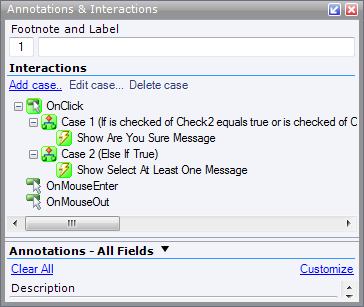 An image, for example, has OnClick, OnMouseEnter and OnMouseOut interaction (an event), a drop down list has OnClick, OnChange, OnFocus and OnLostFocus interactions, and so on. You can add cases to these interactions, and then associate a case with conditions that determine if, and under what conditions, the case fires its associated actions. Linking from the Admin tab to the Profile tab and back. I didn't implement the other tabs. Check if at least one item is checked in the Grid when the delete button on the Grid's toolbar is clicked. To try that out, uncheck all checkboxes and click the big red X on the toolbar. You'll see a dialog appear that tells you to check off at least one item. If you do that, and click the delete button again, you get a different dialog asking for confirmation. You can click Edit on the first Edit button (for ASP.NET 1.x). If you click Save, you're returned to the List page and a confirmation message appears (which disappears after a few seconds). When you click Cancel, you're just taken back to the List page. I set up the toolbar as a rectangle with a bunch of images (I only assigned an actual image for the delete button) and other controls on top of it. I added a Dynamic panel to the prototype. Inside this panel (on a separate tab) I added the UI for the confirmation dialog. I hid the panel (right-click the dynamic panel and choose Edit Dynamic Panel | Set Hidden.). Next, I added an Interaction for the OnClick event of the Delete button on the toolbar. I configured the interactions to look at the checkboxes in the grid and to show the Are You Sure dialog if at least one of them is checked. In all other cases, it should display the dialog with the instructions to select at least one item. After I set up the interactions, they ended up in the Annotations and Interactions panel as shown in Figure 1. Although a bit verbose, I think these expressions are pretty easy to create and understand, even for non-programmers. In the If case (when at least one item is chosen as determined by the Condition shown in Figure 2) or the Else case (which is chosen by default if the If case doesn't evaluate to true) the correct dialog (placed inside a Dynamic Panel) is shown. This is easy to do with the Show Panel action as shown in Figure 3. Figure 3 - Configuring Actions. A similar action is configured in the Else interaction (see Figure 1) which displays another Dynamic Panel when no checkbox has been checked. With these actions and interactions, the final prototype behaves like a real web page, without the cost of programming the actual behavior. This helps to better communicate with your customer and potential end users and helps avoid problems later in the development cycle, where changes to behavior are much more expensive. Another nice feature of Axure is the option to create a specification. Simply by hitting F6 you can generate a Microsoft Word document with a detailed break down of your site's pages, interactions, actions and so on. This will surely help communicate with your client and / or web developer about what is needed and how things are supposed to behave. The specification comes with screen shots of your prototype and details tables of actions and interactions. You can see an example of the specification document here. Good "Getting Started" walkthrough using a local Help File system introducing you to the most common concepts and actions. This walk through is accessible from the Welcome Screen which appears when you start Axure. The Annotations feature is pretty cool as well. A lot of items in Axure can be annotated with extra data - either predefined (like Description, Status and Target Release) or user defined. The annotations you enter are added to the Word specification document and to the final HTML prototype (to see an example, click on the yellow Comment icon for the Admin tab or the Delete button in the demo prototype). A cool feature with Annotations are the "Custom Views" that let you define named sets of data including your own choice of Annotation fields. This lets you focus on the annotation data you care about most, without getting distracted by irrelevant fields (which you can still access if you need them). Axure lets you create prototypes in two formats: HTML - to be viewed by a browser and .chm files (Compiled HTML) to be viewed on a desktop computer. The .chm option is a great way to share a prototype with a client without sending a gazillion separate files. It would have been even better if an Export to PDF (with linked pages) would have been available as well (see later). Axure has an option to create Shared Projects where multiple people can work on the same prototype. A simple Check In / Check Out process stops people from overwriting each others' changes. Complete with history and check in documentation, this feature makes it extremely easy to work on a prototype in a team. Although Axure is pretty powerful and comes with a lot of useful features, I was also surprised by a number of big omissions or limited implementations of some features. Below is my wish list for a future release of Axure. The number of widgets that ships with Axure is surprisingly low, making it almost impossible to create good looking sketches without designing or creating each and every UI element yourself or without downloading external widgets. For example, the Tabs and the Buttons shown in Figure 5 don't ship with Axure out of the box. Fortunately, there's a strong community around Axure. Other users of Axure have created and submitted additional widgets. At the same time, Axure itself is supplying a number of additional widgets. IMO, many of the additional features should ship with the product in the first place. To find more widgets created by Axure, take a look here. You can find community widgets here. One of my favorites is the Better Defaults for Axure, a Widget Library by Loren Baxter. This widget library supplies, well, better defaults for the widgets that ship with Axure. Some other widgets can be found in the Downloads section of the Cone Trees web site. I find the Clear input field value on focus’ prototype/ widget library to be very useful (I used it for the Quick Doc ID box at the top of the page). Finally, the Yahoo! Design Stencil Kit is definitely worth checking out. Keyboard navigation could certainly be improved to make things more usable. Axure could benefit from the smart keyboard behavior Balsamiq - discussed in part 1 of this series - has. For example, when you add a new Menu, you get three items by default. It would be great if simply pressing Tab on the third item would create a fourth menu item next to it. Same goes for other common keyboard behavior. For example, why can't I delete an Interaction case by pressing Del. Why do I have to right-click and choose Delete Case instead? Another improvement that would be welcome is "Redo" or "Repeat" for actions you just carried out. For example, I create a new menu and then add a new menu item by right-clicking the menu and choosing Add Menu Item After. It would be handy if you could press Ctrl+Y to repeat the last action and add another menu item. The Tab bar (displaying the open documents) could be enhanced with a right-click menu with options such as Close, Close All, Close All But This etc. This is particularly useful after an action such as "Edit all states" which opens a lot of windows. There is no "Export to PDF" option which I really miss. Being able to export a complete prototype to a PDF with links maintained makes it easy to quickly send some drafts to a client. Clearly, a lot of functionality would be lost in the transition to PDF as it doesn't support all interactions available in Axure, but quite often that's not a problem. I know I can send .chm files with all interactions available, but these files come with problems of their own as Windows by default blocks certain functionality in them when they are downloaded from the Internet. In addition to a static screen shot, you can also try out a live version of the Prototype here. Notice I didn't implement a whole lot of functionality; only the Profile and Admin tabs are clickable and deleting and editing of categories "works". Axure is a an excellent took to create high-fidelity, complex mockups that require a lot of interaction. Be prepared for a learning curve though, especially when implementing complex interactions with programmed behavior. Fortunately, the program and the accompanying web site have a large number of walkthroughs and other tutorials. Additionally, you can find a number of videos that show how to use Axure in the Videos section of their web site. If you need to create high-fidelity, complex and programmable prototypes, Axure RP Pro is definitely worth checking out. Application Mode Desktop, with a standalone installer. Linking Yes, through simple linking or through programmability. Simple Linking uses the same interaction mechanism but enables you to link elements with just a few clicks. Exporting Yes, to HTML and to .chm files for stand alone viewing. Unfortunately, exporting to PDF is not available. Run-time viewer and annotation options No, both the HTML and the .chm version are read-only. Programmability (to change click behavior in presentation mode) Yes, fully programmable. UI Types Out of the box: generic, not tied to a UI or OS. Third party: Widgets for OS X. Good idea for a series of blogs. This was one executed well; look forward to the rest. I hope you will be choosing a favourite and not sitting on the fence at the end, though. As a user of photoshop I have rarely used those build it clipart and brushes - rather building my own. Depending on what you use Photoshop for, I agree it makes sense to develop your own designs. However, for sketches and mockups, often the actual looks aren't that important, but what your design communicates is. So, I don't care much how a Tab control looks, as long as I can add one without a lot of manual work. Interesting article, thank you. Recently I heard about a wireframe tool named "ForeUI", will you review this tool as well? I wasn't aware of ForeUI. I'll add it on my "maybe" list and review it if I find the time, and if it makes sense to do so. In my opinion the most challenging to AxureRP Pro is Justinmind Prototyper. No, I don't have a public list, other than the tools listed at the beginning of the article. I just read your Axure review and want to ask you something - we are launching a new prototyping tool - GenericFrame, and need expert feedback. Are you interested in taking a look at it and maybe review it. We don't want praise, we need honest opinion. If you are interested in our tool, please contact me. Website is www.genericframe.com. Hi Please could you Help? i use web studio 5 to design my sites and ive recently started trialing the Axure software excuse me for the simplicity of my question but can i intergrate a Axure project into my website. if not how can I? Not sure I understand what you're asking. Try asking this at the Axure site.